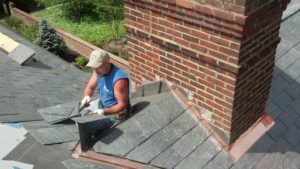 Emergency Roof Repair Catonsville | Roland Slate Service Co. These are typically the most urgent roof repair services needed, but keep in mind that broken or missing shingles can equate to an emergency pretty quickly if not repaired expediently. Make sure you stay on top of necessary roof repairs before they cause lasting damage. Flexible hours – We’ll work around your schedule to get your roof fixed up as quickly as possible. Unparalleled customer service – We understand these situations can be stressful, so we strive to treat our customers with compassion, care, and respect during an emergency roof repair project. Decades of experience – We’ve been repairing roofs since 1989, so we’re the ones to turn to when you want a seasoned professional for your roofing repair project. If you’ve landed in a situation in which you require emergency roof repair, call Roland Slate Service Company for help. We’ll schedule a consultation at your Catonsville home as quickly as possible!